Don't worry, y'all. I'm not going anywhere. However, today is the last day of National Hermit Crab Week. Boy, did it take a long time for this week to get here! That is, for me it did. I planned about a week ahead of time, and the week couldn't feel longer, so naturally I was thrilled when the week arrived. But now it's over. Y'all, I'm not saying that I won't be posting about hermit crabs again. Brigadier and Lola will be making many more appearances on my blog...trust me...many. Since I adopted the twosome in September, I wasn't really sure how to incorporate them into my blog and if I should post often about them. I didn't know how to fit Brigadier and Lola into the scheme of my blog and how they could make things happen with the readers. It sounds odd, but it's true. 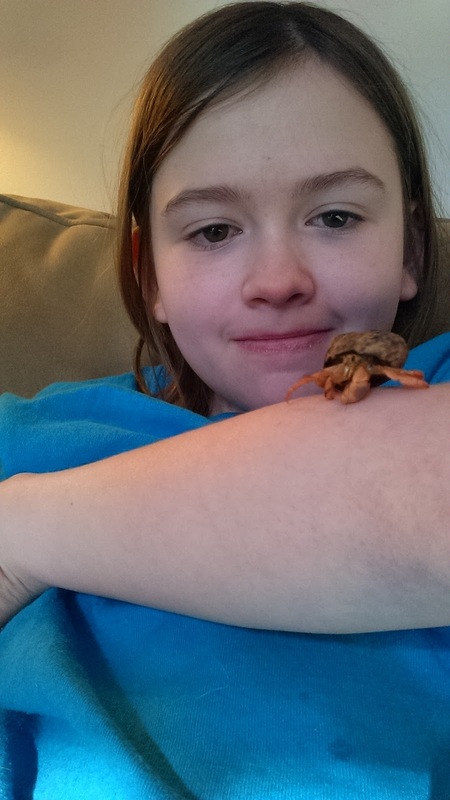 But this week made me realize that I can have fun posting about my hermit crabs and that they work finely into my blog. You readers have supported us through the week and though I've always known that fellow bloggers wouldn't mock my crabs in any way, I was surprised to see how much our readers loved with Brigadier and Lola...they learned to connect with them. That being said, I hope this week has inspired someone...even just one person...to look into hermit crabs and find out who they really are and why they're important. And learn how to connect with them. I hope one person has learned why I even care to keep hermit crabs and call them my own. Why I'm proud to be a hermit crab parent and why I love them like I'd love any pet. I hope one person has taken everything they learned this week and used that energy to take in a hermit crab. Or two. Or three. Or however many hermit crabs that person feels they can provide a loving home for. A hermit crab isn't just a pet, but they're a family member. As with any animal, they have their own unique personalities that a dedicated person can discover by interacting with the small creatures. Friends, I think I came to a conclusion. I think I know that the problem is. Hermit crabs are yet to be discovered. When they are, there will be no reason for anyone to rebuke them, but to love them. Yes, they might pinch sometimes or you think that shell on that back is rather ugly and top heavy, but it's none of your business, really. I feel like I just needed to say all of this, and of course, thank you for being here for Brigadier and Lola and helping them become great blog personalities...even though they're a bit obsessed with seafood. Please come back next year for National Hermit Crab Week 2017, and of course, come back again tomorrow for our normal Paw Province posts. All Brigadier and I want is a brighter tomorrow for hermit crabs around the world. Oh, and sorry for the terrible lighting in the photo below, but hey, that's where I happened to be when Brigadier was in the mood for a selfie. I wasn't camera ready, but boy, was Brigadier! Our pal Sarge has hermit crabs and he features them on Crabby Mondays. Maybe your crabs need a day of the week! Perhaps...I'll keep that in mind! Oh, you are both lovely and we are clacking our claws in applause! What a glorious week of fun and information. We are definitely entertaining and joyous additions to any home. I know we will be seeing you around. You are an ambassador for Hermit Crabs for sure! I'm proud to be one! Hermies are awesome, huh?